Glechoma Hederacea.--It is also called Cat's-foot, Alehoof, Gill-go-by-ground, and Gill-creep-by ground, Turnhoof, Hay- maid's, and Jack-by-the-Hedge. 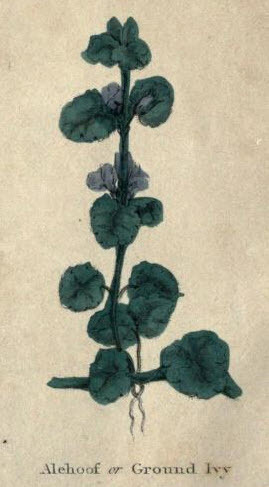 Ground Ivy creeps upon the ground, sends forth the roots at the corners of tender jointed stalks, and has two round leaves at every joint, crumpled, and dented about the edges. The stalks are hollow and square, a foot or more in length. It has hollow long flowers of a blueish purple colour, with small white spots upon the lips which hang down. The root is small and fibrous. It is found under hedges, and on the sides of ditches, in shady lanes, and waste grounds. The plant has a peculiar smell; it flowers early, and it should be gathered when in flower. In short, this is a valuable herb, and ought to be gathered in the season by every family for use. Such a step would never be regretted.